This document briefly outlines the essential steps in calling short germline variants, and recommends tools that have gained community acceptance for this purpose. This document briefly outlines the essential steps in the process of making genetic variant calls, and recommends tools that have gained community acceptance for this purpose. It is assumed that the purpose of the study is to detect short germline or somatic variants in a single sample. Recommended coverage for acceptable quality of calls in a research setting is around 30-50x for whole genome and 70-100x for exome sequencing, but lower coverage is discussed as well. The procedures outlined below are recommendations to the H3ABioNet groups planning to do variant calling on human genome data, and are not meant to be prescriptive. Our goal is to help the groups set up their procedures and workflows, and to provide an overview of the main steps involved and the tools that can be used to implement them. For optimizing a workflow or an individual analysis step, the reader is referred to 1,2,3. The table below (partly borrowed from the GATK dictionary 4 ) provides definitions of the basic terms used. allow for indexing or “barcoding” of samples, so multiple DNA libraries can be mixed together into 1 sequencing lane. A unit of DNA preparation that at some point is physically pooled together. Multiple lanes can be run from aliquots from the same library. The DNA library is the natural unit that is being sequenced. For example, if the library has limited complexity, then many sequences are duplicated and will result in a high duplication rate across lanes. See 8 for more details. A single individual, such as human CEPH NA12878. Multiple libraries with different properties can be constructed from the original sample DNA source. Here we treat samples as independent individuals whose genome sequence we are attempting to determine. From this perspective, tumor/normal samples are different despite coming from the same individual. Specifications intended to eliminate batch effects and promote data interoperability by standardizing pipeline implementations: used tools, versions of these tools, and versions of reference genomic files. Large genomic databases, like gnomAD and TOPmed are being processed by pipelines adhering to these specifications. Two variant calling pipelines are functionally equivalent if they can be run independently on the same raw WGS data to produce aligned files (BAM or CRAM files) that yield genome variation maps (VCF files) that have >98% similarity when analyzed by the same variant caller(s). The publication by 10 provides a good discussion of the common tools and approaches for variant calling. Also see the older 11. The figure below depicts the essential steps of the pipeline, which are detailed in the subsequent sections. The Genome Analysis Toolkit (GATK) distributed by the Broad Institute of Harvard and MIT (see http://www.broadinstitute.org/gatk/) is a commonly used framework and toolbox for many of the tasks described below. In its latest 4.0 release, the GATK is now completely open source. While we recommend GATK tools for many of the tasks, we try also to provide alternatives for those organizations that cannot or do not wish to use GATK (i.e for licensing reasons with older GATK versions). Please also note that while the key analysis steps remain the same, the GATK4 is intended to become a spark-based rewrite of GATK3. Many GATK4 tools come in spark-capable or non-spark-capable modes, and can run locally, on a Spark cluster or on Google Cloud Dataproc 12. There are some differences in invocation highlighted below, and where tools names have changed this is also indicated. A better introduction to the GATK3 is found here: https://software.broadinstitute.org/gatk/documentation/quickstart?v=3 and to the GATK4 is found here https://software.broadinstitute.org/gatk/documentation/quickstart?v=4 . Their computational performance is discussed here 1. The following steps prepare reads for analysis and must be performed in sequence. Sequencing facilities usually produce read files in fastq format 13, which contain a base sequence and a quality score for each base in a read. Usually the adaptor sequences have already been removed from the reads, but sometimes bits of adapters are left behind, anywhere from 90% to 20% of the adaptor length. These need to be removed from the reads. This can be done using your own script based on a sliding window algorithm. A number of tools will also perform this operation: Trimmomatic 14, Fastx-toolkit (fastx_clipper), Bioconductor (ShortRead package), Flexbar 15, as well as a number of tools listed on BioScholar 16 and Omics tools 17 databases. Selection of the tool to use depends on the amount of adaptor sequence leftover in the data. This can be assessed manually by grepping for parts of known adaptor sequences on the command line. Once the adaptors have been trimmed, it is useful to inspect the quality of reads in bulk, and try to trim low quality nucleotides 18. Also, frequently the quality tends to drop off toward one end of the read. FASTQC 19 and PrinSeq 20 will show that very nicely . These read ends with low average quality can then be trimmed, if desired, using Trimmomatic 14, FASTX-Toolkit fastq_quality_filter, PrinSeq, or SolexaQA 21. Once the adaptor remnants and low quality ends have been trimmed, some reads may end up being very short (i.e. <20 bases). These short reads are likely to align to multiple (wrong) locations on the reference, introducing noise into the variation calls. They can be removed using PrinSeq, Trimmomatic (using the MINLEN option), or a simple in-house script. Minimum acceptable read length should be chosen based on the length of sequencing fragment: longer for longer fragments, shorter for shorter ones – it is a matter of some experimentation with the data. The three pre-processing steps above can be parallelized by chunking the initial fastq file (hundreds of millions of reads, up to 50-150 G of hard disk space per file depending on sequencing depth) into several files that can be processed simultaneously. The results can then be combined. Analysis proceeds as a series of the following sequential steps. Reads need to be aligned to the reference genome in order to identify the similar and polymorphic regions in the sample. As of 2016, the GATK team recommends their b37 bundle as the standard reference for Whole Exome and Whole Genome Sequencing analyses pending the completion of the GRcH38/Hg38 bundle 22. However, the 2018 functional equivalence specifications recommends the GRCh38DH from the 1000 Genomes project <9. Either way, a number of aligners can perform the alignment task. Among these, BWA MEM 23 and bowtie2 24 have become trusted tools for short reads Illumina data, because they are accurate, fast, well supported, and open-source. Combined with variant callers, different aligners can offer different performance advantages with respect to SNPs, InDels and other structural variants, benchmarked in works like 23,25,26. Functional equivalence specifications recommends BWA-MEM v0.7.15 in particular (with at least the following parameters -K 100000000 -Y, and without -M so that split reads are marked as supplementary reads in congruence with BAM specification ). The output file is usually in a binary BAM format 27, still taking tens or hundreds of Gigabytes of hard disk space. The alignment step tends to be I/O intensive, so it is useful to place the reference onto an SDD, as opposed to HDD, to speed up the process. The alignment can be easily parallelized by chunking the data into subsets of reads and aligning each subset independently, then combining the results. The presence of duplicate reads in a sequencing project is a notorious problem. The causes are discussed in a blog post by Eric Vallabh Minikel (2012) 28. Duplicately sequenced molecules should not be counted as additional evidence for or against a putative variant – they must be removed prior to the analysis. A number of tools can be used including: samblaster 29, sambamba 30, the commercial novosort from the novocraft suit <31, Picard, and FASTX-Toolkit has fastx_collapser for this purpose. Additionally, MarkDuplicates is shipped as part of GATK4, but is called from Picard tools 32 in older GATK releases. For functional equivalence 9, it is recommended to use Picard tools v>2.4.1. De-duplication can also be performed by a simple in-house written Perl script. Some artifacts may arise due to the alignment stage, especially around indels where reads covering the start or the end of an indel are often incorrectly mapped. This results in mismatches between the reference and reads near the misalignment region, which can easily be mistaken for SNPs. Thus, the realignment stage aims to correct these artifacts by transforming those regions with misalignment due to indels into reads with a consensus indel for correct variant calling. Realignment can be accomplished using the GATK IndelRealigner 33 (https://software.broadinstitute.org/gatk/documentation/tooldocs/3.8-0/org_broadinstitute_gatk_tools_walkers_indels_IndelRealigner.php ). Alternatives include Dindel 34 (https://github.com/genome/dindel-tgi ) and SRMA 35 (https://github.com/nh13/SRMA ). The inclusion of the realignment stage in a variant calling pipeline depends on the variant caller used downstream. This stage might be of value when using non-haplotype-aware variant caller like the GATK’s UnifiedGenotyper 36. However, if the tool used for variant calling is haplotype-aware like Platypus 37, FreeBayes 38 or the HaplotypeCaller 39, then it is not needed nor recommended. The GATK recommendations starting from their 3.6 release onwards, and the guidelines for functional equivalence 9 also vote against this stage. Ultimately however, characteristics of the dataset at hand would dictate whether realignment and other clean-up stages are needed. Ebbert et al paper for example argues against PCR duplicates removal 40, while Olson et al recommends all the stages of clean up applied to the dataset at hand 41. Some experimentation is therefore recommended when handling real datasets. Base quality scores, which refer to the per-base error estimates assigned by the sequencing machine to each called base, can often be inaccurate or biased. The recalibration stage aims to correct for these errors via an empirical error model built based on the characteristics of the data at hand 33. The quality score recalibration can be performed using GATK’s BQSR protocol 33, which is also the recommendation for functional equivalence, along with specific reference genome files 9. For speed up of analysis, and if using GATK < v4, one may skip the PrintReads step and pass the output from BaseRecalibrator to the HaplotypeCaller directly. Bioconductor’s ReQON is an alternative tool 42 for this purpose. mpileup from SAMtools (tutorial is available on the ANGUS site, Michigan State university http://ged.msu.edu/angus/tutorials-2012/snp_tutorial.html). Recently, MuTect2 was added as a variant discovery tool to the GATK specifically for cancer variants. MuTect2 calls somatic SNPs and indels by combining the original MuTect 44 with the HaplotypeCaller. The HaplotypeCaller relies on diploid assumption, while MuTect2 allows for different allelic fractions for each variant. This makes the caller useful in tumor variant discovery. Joint calling (GVCF generation) is not available in MuTect2. The variant calls are usually produced in the form of VCF files 45, occupying much smaller size than the BAMs generating them. This last preliminary stage is highly dependent on the study design and objectives, so only a brief coverage is provided herein. The VCF files resulting from the previous steps frequently have many sites that are not really genetic variants, but rather machine artifacts that make the site statistically non-reference. In small studies, hard filtering of variants based on annotations of genomic context is typically sufficient. Mendelian disease linked variants: VAR-MD, KGGSeq, FamSeq 49. The following are questions to keep in mind when running the NextGen Workflow during the H3ABioNet accreditation exercise. Use them to plan your work in a way that would allow gathering the necessary information for your final report. The report should not be limited to only providing brief answers to these questions; it is expected to be a well-rounded description of the process of running the workflow, and of the results. Please note that only Phase I and Phase II of the variant calling SOP need to be performed. How many variants were called with sufficient confidence to be included in further analyses? Are the results good and trustworthy, and can you estimate the sensitivity and selectivity of the analysis? How do you know the workflow completed successfully and the results are worth analyzing further? How many variants were located in intronic, exonic, or in non-genic regions? Put this in context of the nature of the input dataset as described in the README. How many variants were found in dbSNP and how many were unique to your sample? What does it mean? What is the fraction of simple variants (SNPs, small indels) versus complex variants (translocations, inversions, etc.)? How is this influenced by your choice of software and parameters? What would be the next steps for your analysis, given this information? ANNOVAR————————————————–http://annovar.openbioinformatics.org/en/latest/ Utilizes update-to-date information to generate gene-based, region-based and filter-based functional annotations of genetic variants detected from diverse genomes. Annotate the variants in ex1.human file and classify them as intergenic, intronic, non-synonymous SNP, frameshift deletion, large-scale duplication, etc. The ex1.human file is in text format, one variant per line. The annotation procedure takes seconds on a typical modern computer. Download cytogenetic band annotation databases from the UCSC Genome Browser and save it to the humandb/ directory as hg18_cytoBand.txt file, then annotate variants in ex1.human file and identify the cytogenetic band for these variants. Download 1000 Genome Projects allele frequency annotations, then identify a subset of variants in ex1.human that are not observed in 1000G CEU populations and those that are observed with allele frequencies. Note: By default, all the above commands work on variants files in hg18 (human genome NCBI build 36) coordinate. If your file is in hg19 coordinate, add “-buildver hg19” in every command. Bed tools————————————————————-http://bedtools.readthedocs.io/en/latest/ A flexible suite of utilities for comparing genomic features. Bioconductor—————————————————————————http://bioconductor.org/ Provides tools for the analysis and comprehension of high-throughput genomic data. Bioconductor uses the R statistical programming language, and is open source and open development. # can be specified by providing a numeric vector of length nchar(mypattern). # The numbers specifiy the number of mismatches for each partial match. # e.g. most terminal nucleotides. Database and query are each either a .fa , .nib or .2bit file, or a list these files. The option -ooc=11.ooc tells the program to load over-occurring 11-mers from an external file. This will increase the speed by a factor of 40 in many cases, but is not required. Bowtie2———————————————http://bowtie-bio.sourceforge.net/bowtie2/index.shtml An ultrafast and memory-efficient tool for aligning sequencing reads to long reference sequences. It is particularly good at aligning reads of about 50 up to 100s or 1,000s of characters to relatively long (e.g. mammalian) genomes. -x <bt2-idx>  --  The basename of the index for the reference genome. The basename is the name of any of the index files up to but not including the final .1.bt2 / .rev.1.bt2 / etc. bowtie2 looks for the specified index first in the current directory, then in the directory specified in the BOWTIE2_INDEXES environment variable. -1 <m1>  --  Comma-separated list of files containing mate 1s (filename usually includes _1), e.g. -1 flyA_1.fq,flyB_1.fq. Sequences specified with this option must correspond file-for-file and read-for-read with those specified in <m2>. Reads may be a mix of different lengths. If - is specified, bowtie2 will read the mate 1s from the "standard in" or "stdin" filehandle. -2 <m2>  --  Comma-separated list of files containing mate 2s (filename usually includes _2), e.g. -2 flyA_2.fq,flyB_2.fq. Sequences specified with this option must correspond file-for-file and read-for-read with those specified in <m1>. Reads may be a mix of different lengths. If - is specified, bowtie2 will read the mate 2s from the "standard in" or "stdin" filehandle. -U <r>   --  Comma-separated list of files containing unpaired reads to be aligned, e.g. lane1.fq,lane2.fq,lane3.fq,lane4.fq. Reads may be a mix of different lengths. If - is specified, bowtie2 gets the reads from the "standard in" or "stdin" filehandle. -S <sam> --  File to write SAM alignments to. By default, alignments are written to the "standard out" or "stdout" filehandle (i.e. the console). BWA——————————————————————————http://bio-bwa.sourceforge.net/ Burrows-Wheeler Alignment Tool. A software package for mapping low-divergent sequences against a large reference genome, such as the human genome. It consists of three algorithms: BWA-backtrack, BWA-SW and BWA-MEM. The first algorithm is designed for Illumina sequence reads up to 100bp, while the rest two for longer sequences ranged from 70bp to 1Mbp. BWA-MEM and BWA-SW share similar features such as long-read support and split alignment, but BWA-MEM, which is the latest, is generally recommended for high-quality queries as it is faster and more accurate. BWA-MEM also has better performance than BWA-backtrack for 70-100bp Illumina reads. Find the SA coordinates of the input reads. Generate alignments in the SAM format given paired-end reads shorter than ~70bp. FASTX-Toolkit——————————————————-http://hannonlab.cshl.edu/fastx_toolkit/ A collection of command line tools for Short-Reads FASTA/FASTQ files preprocessing. [-q N]  =  Minimum quality score to keep. [-p N]  =  Minimum percent of bases that must have [-q] quality. [-z]    =  Compress output with GZIP. [-i INFILE]  =  FASTA/Q input file. default is STDIN. [-o OUTFILE]  =  FASTA/Q output file. default is STDOUT. Flexbar———————————————————- https://github.com/seqan/flexbar Flexbar — flexible barcode and adapter removal. Flexbar is a software to preprocess high-throughput sequencing data efficiently. It demultiplexes barcoded runs and removes adapter sequences. Trimming and filtering features are provided. Flexbar increases mapping rates and improves genome and transcriptome assemblies. It supports next-generation sequencing data from Illumina, Roche 454, and the SOLiD platform. Recognition is based on exact overlap sequence alignment. GATK————————————————————————http://www.broadinstitute.org/gatk/ Genome Analysis Toolkit - a software package developed at the Broad Institute to analyse next-generation resequencing data. The toolkit offers a wide variety of tools, with a primary focus on variant discovery and genotyping as well as strong emphasis on data quality assurance. Its robust architecture, powerful processing engine and high-performance computing features make it capable of taking on projects of any size. Call SNPs and indels simultaneously via local de-novo assembly of haplotypes, combining the MuTect genotyping engine and the assembly-based machinery of HaplotypeCaller. For cancer variant discovery. Tumor/Normal or Normal-only calls. HuVariome——————————————————————–http://huvariome.erasmusmc.nl/ The HuVariome project aims to determine rare and common genetic variation in a Northern European population (Benelux) based on whole genome sequencing results. Variations, their population frequencies and the functional impact are stored in the HuVariome Database. Users who provide samples for inclusion within the database are able to access the full content of the database, whilst guests can access the public set of genomes published by Complete Genomics. Has a straightforward web interface. KGGSeq—————————————————http://statgenpro.psychiatry.hku.hk/limx/kggseq/ A biological Knowledge-based mining platform for Genomic and Genetic studies using Sequence data. a linkage pedigree file (rare.disease.ped.txt). NEAT-genReads—————————————https://github.com/zstephens/neat-genreads.git NEAT-genReads is a fine-grained read simulator published in PLoS One 53. GenReads simulates real-looking data using models learned from specific datasets. Simulated reads can be whole genome, whole exome, specific targeted regions, or tumor/normal, with optional vcf and bam file outputs. Additionally, there are several supporting utilities for generating models used for simulation. Requires Python 2.7 and Numpy 1.9.1+. Simulate whole genome dataset with random variants inserted according to the default model. Generates paired-end reads, bam, and vcf output. Simulate a targeted region of a genome, e.g. exome, with -t. Generates paired-end reads, bam, and vcf output. Picard MarkDuplicates—– https://software.broadinstitute.org/gatk/documentation/tooldocs/4.0.4.0/picard_sam_markduplicates_MarkDuplicates.php Examines aligned records in the supplied SAM or BAM file to locate duplicate molecules. All records are then written to the output file with the duplicate records flagged. For a comprehensive list of options, see the utility’s documentation page listed above. Multiple databases can be used to annotate variants————–http://regulome.stanford.edu/ A database that annotates SNPs with known and predicted regulatory elements in the intergenic regions of the H. sapiens genome. Known and predicted regulatory DNA elements include regions of DNAase hypersensitivity, binding sites of transcription factors, and promoter regions that have been biochemically characterized to regulation transcription. Source of these data include public datasets from GEO, Chromatin States from the Roadmap Epigenome Consortium, the ENCODE project, and published literature. SolexaQA++———————————————————————-http://solexaqa.sourceforge.net/ SolexaQA is a software package to calculate sequence quality statistics and create visual representations of data quality for Illumina’s second-generation sequencing technology (historically known as “Solexa”). # an html summary file and text files with detailed information. SnpSift————————————————————-http://snpeff.sourceforge.net/SnpSift.html Helps filter and manipulate annotated files. Included in GATK. Once your genomic variants have been annotated, you need to filter them out in order to find the “interesting / relevant variants”. Given the large data files, this is not a trivial task (e.g. you cannot load all the variants into XLS spreasheet). SnpSift helps to perform this VCF file manipulation and filtering required at this stage in data processing pipelines. The Variant Annotation, Analysis and Search Tool) is a probabilistic search tool for identifying damaged genes and their disease-causing variants in personal genome sequences. 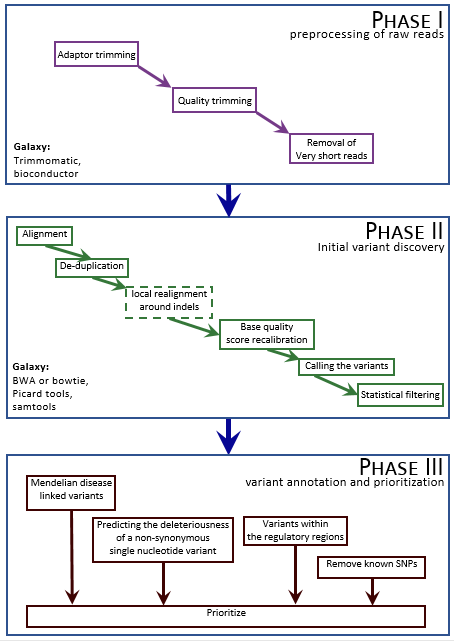 VAAST builds upon existing amino acid substitution (AAS) and aggregative approaches to variant prioritization, combining elements of both into a single unified likelihood-framework that allows users to identify damaged genes and deleterious variants with greater accuracy, and in an easy-to-use fashion. VAAST can score both coding and non-coding variants, evaluating the cumulative impact of both types of variants simultaneously. VAAST can identify rare variants causing rare genetic diseases, and it can also use both rare and common variants to identify genes responsible for common diseases. VAAST thus has a much greater scope of use than any other existing methodology. A set of target (case) variant files in either VCF or GVF format. A set of background (control) variant files in either VCF or GVF format. A set features to be scored, usually genes; this file should be in gff3 format. VCF can be easily converted to GVF using the vaast_converter script, included with the distribution: VAAST/bin/vaast_tools/vaast_converter.